With a $2.7 billion redevelopment plan to overhaul Newark Liberty International Airport’s oldest terminal, the Siegel Brothers called on Strong Man to help advertise the airport’s vision. Previous Terminal A will undergo a complete renovation, re-named Terminal One, which broke ground last June and is set to be fully completed by 2022. Despite the project’s longevity, it is expected to offer over 23,000 jobs, $1.9 billion in wages and stimulate $4.6 billion in economic activity, according to Port Authority. 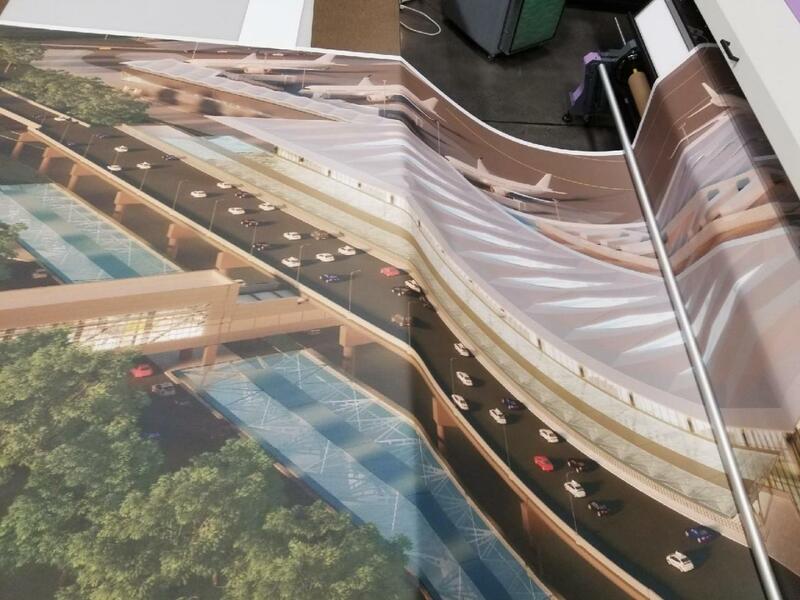 The Siegel Brothers decided to share their Terminal One vision with the old terminal’s 10.6 million annual passengers by using our Logo Branded Material on Customized Printed Mesh. And what better way than to make a 16,000-foot wall mural? Luckily for the Siegel Brothers, our product is made-to-order—a perfect feature for logo branding and marketing. Our Custom-Printed Mesh can also be used for a variety of projects, such as advertisements and public relations, co-branding with partners and custom retail and commercial décor solutions. Located in Brooklyn, N.Y., The Siegel Brothers have been a long-time customer of ours, so of course, we were happy to help. This printed mesh is made from superior strength reinforced PVC vinyl fabric, and it has heat sealed edges and grommets. We use only high-resolution logo and image printing and we offer various shade factors. This UV-treated printed mesh comes fire retardant, and meets NFPA 701 Test Method II standards, because safety is our top priority. For larger-than-life projects, Strong Man offers larger-than-life options to meet any of your advertising and safety needs. We’re proud to help The Siegel Brothers and Newark Liberty International Airport envision this amazing project. If you have any questions or want to learn more, please contact us. Let Strong Man help your message land with impact. Safety First. Go Strong.